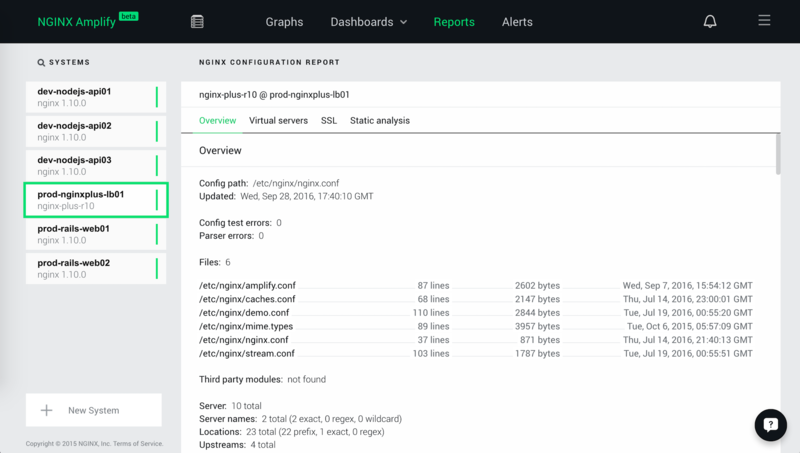 NGINX Amplify, our new cloud‑based monitoring and assistance platform, has been very successful so far. Thousands of NGINX users are learning more about their installations, monitoring and improving server performance, and tuning configuration, security, and scalability problems using NGINX Amplify. 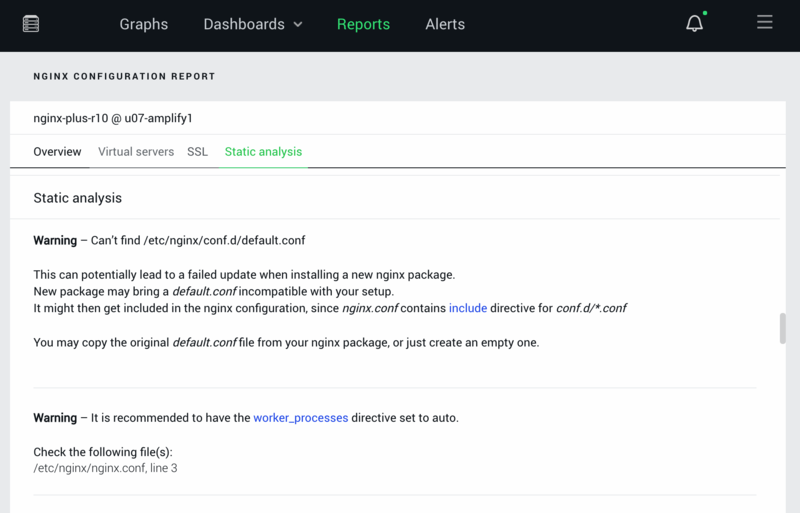 NGINX Amplify analyzes your NGINX configuration, and provides useful recommendations based on years of our collective experience with tuning, optimizing, and operating NGINX‑powered sites. We created this service so you can take advantage of this knowledge and have all your configuration files checked by our automated system. This post provides some deeper insight into one specific feature of NGINX Amplify – configuration reports – and how to use the service to optimize your NGINX configuration. The NGINX Amplify Agent is open source Python‑based software. The agent collects metadata and metrics from the operating system and all metrics available from NGINX. NGINX Amplify processes and analyzes the configuration files for all your NGINX instances. Every time the agent is started, or when the NGINX configuration is changed, the NGINX Amplify Agent parses configuration files. It does this for every running NGINX instance on the system. Parsed configuration data is sent to NGINX Amplify Cloud for automated analysis. Click the name of a system in the Systems list. Click the Reports tab. The NGINX configuration report for that system appears. The report consists of several sections. We will describe each section here. The Version section reports the version of NGINX software in use, the NGINX branch the version comes from (stable or mainline), the release date, and the most recent release on this branch. Use this information to see if you are on the latest release from the branch you’ve chosen – for instance, if you are on the most recent mainline release. If not, consider upgrading to get the latest features and most recent bug fixes. Use this information to confirm the current status of your NGINX configuration files and to look for recent changes. The Security section does not appear if no security issues are found. This section lists security advisories against the currently installed version of NGINX. The information includes a description, a pointer to any relevant advisories, the severity level, and a list of versions of NGINX that are not vulnerable to this security advisory, so you can consider upgrading. If you are not using an official build, there’s a potential complicating factor: some security fixes may be “backported” into older versions. For instance, you may see a report that says you are running version 1.8.1 with a vulnerability to CVE‑2016‑4450, which is shown as fixed for version 1.8.3. However, for non‑official builds, the fix may have already been applied to your system by your own security team or by a third party. Check the documentation for non‑official builds to see if security vulnerabilities listed in NGINX Amplify reports have been fixed for that build. We recommend using the latest official builds whenever possible. Note: In order for NGINX Amplify Agent to check your SSL certificates, you must grant it filesystem access. See the instructions in our introductory NGINX Amplify blog post and the NGINX Amplify reference documentation for more information. The SSL section tells you which version of SSL this NGINX instance is built with and which version it is dynamically linked with. This section lists the number of SSL‑enabled servers, HTTP/2‑enabled servers, and SSL certificates. Additional warnings are displayed when the SSL certificate expiration date is close or certificate renewal is overdue. Your SSL certificates are analyzed in place, and private keys NEVER leave your servers. Note: If you have performed an upgrade of the OpenSSL library, perform a full restart or upgrade of the NGINX service. A configuration reload (nginx ‑s reload) does not change the running libraries. The Static analysis section lists recommendations for improving your configuration file and settings. 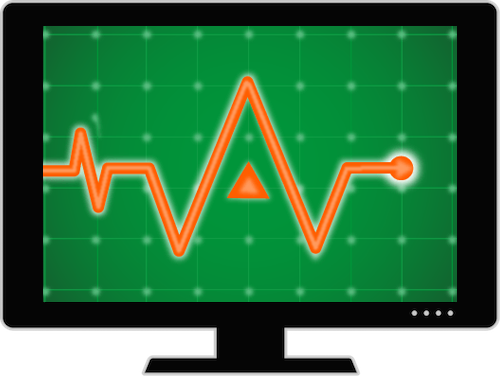 Recommendations can address security, completeness, error prevention, and other areas. For each recommendation, NGINX Amplify lists it, along with filenames and line numbers where it was triggered. Recommendations include links to the reference documentation, where all directives and their parameters are fully described. Figure 2 shows an example of an error and a warning resulting from static analysis of the configuration. Additional examples appear below the figure. Fix the configuration file(s) as suggested in the explanation of the error or warning. Wait about a minute for the agent to parse new configuration files and send data to NGINX Amplify Cloud. Refresh the report to verify that the error or warning no longer appears. Warning: Can’t find /etc/nginx/conf.d/default.conf. This can potentially lead to a failed update when installing a new Plus nginx package. New package may bring a default.conf incompatible with your setup. It might get included then in the nginx configuration since nginx.conf contains include directive for conf.d/*.conf. Warning: It is recommended to include default_server parameter for each unique listen IP:port combination. If none of the listen directives have the default_server parameter, then the first server with a particular IP:port tuple becomes the default one. Default server is the server that will process requests that can’t be matched against any of the configured server_name’s. Warning: There should be normally a unique server_name directive per server. Please ensure that a server_name contains all possible virtual server names for your site(s). Error: Found parameter to a listen directive with a specific IP address, that puts it in conflict with a wildcard listen directive for the same port. While it is possible to make nginx listen on the same port with a wildcard socket and a specific IP address, such combination is not compatible with anything but default_server, ssl, spdy, proxy_protocol or http2 listen parameters. Error: location has a regex pattern, but does not have a valid regex operator. Please make sure this is a desired behavior, since nginx location matching will not work with what is seemingly a regex pattern – but without proper regex operator. No issues found with the current configuration. Click the Settings menu (the “hamburger” menu in the upper right corner of the NGINX Amplify Web page). Click Account. Account setting‑related options appear at the bottom of the page. Enable NGINX config analyzer – If enabled, the NGINX Amplify Agent regularly reads the configuration files and sends configuration file data, including directives and parameters, to NGINX Amplify Cloud. This option is enabled by default. Enable periodic “nginx ‑t” – If enabled, the NGINX Amplify Agent regularly runs the nginx ‑t command to check whether the configuration has syntax errors. Typically a fully successful execution of the configuration test requires root privileges, and running it with the agent’s default permissions results in warnings in the NGINX error.log file. This option is disabled by default. 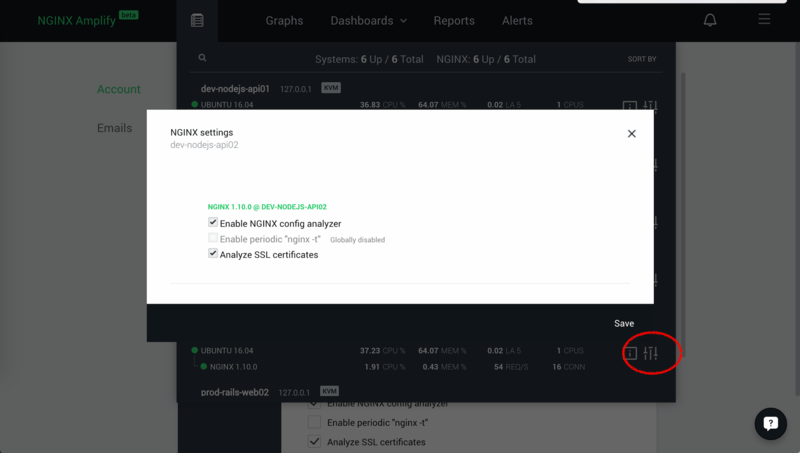 Analyze SSL certificates – If enabled, the NGINX Amplify Agent periodically reads SSL certificates to check their details and expiration time. This option is enabled by default. Open the Inventory menu (the “server rack” icon in the top navigation bar). Select the NGINX instance you need to control and open the settings for it by clicking the icon circled in Figure 4. Enable or disable the three options in the pop‑up window. 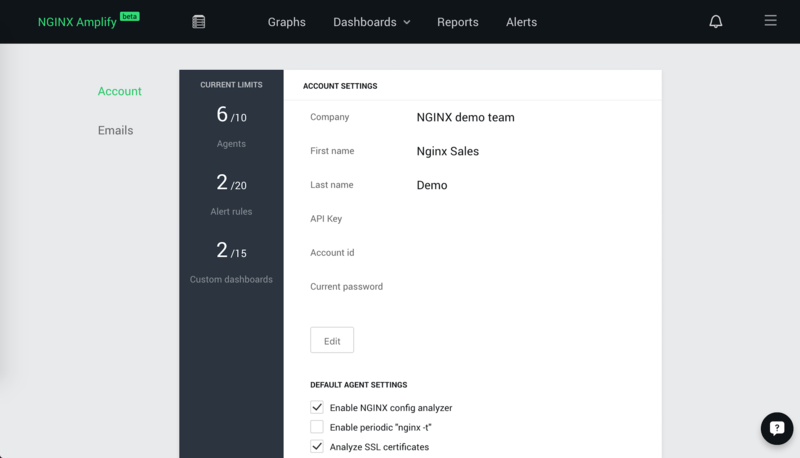 This post goes into depth about one capability of NGINX Amplify: configuration reporting. We’ve shown you how to get a report on your current configuration, customized by the type of information you want to review and the servers (Unix servers and NGINX servers) you wish to include. Future blog posts will go into more depth about other ways to use NGINX Amplify to monitor NGINX and improve the performance of your site and apps. We look forward to your using NGINX Amplify, and to your feedback about how to improve it further. Click the ? icon in the lower right corner of the NGINX Amplify Web page to provide feedback, or send us a message in the Comments below. Sign up for free and start using NGINX Amplify today.